Obtaining a new passbook should be a relatively straightforward affair. But I have learned that having a Thai perform anything halfway complicated for you may involve unexpected surprises. I came to my bank fully prepared. Besides my old booklet, I also had a note from a Thai friend explaining what I wanted. Showing both items to a teller, it appeared she understood and after five or ten minutes of her bouncing from one computer terminal to another, I was presented with a bright new passbook in the distinctive shades of purple that Siam Commercial Bank (SCB) likes to use. Everything had gone smoothly and I started back home. I was about four blocks from the bank when I realized I had forgotten to try my new passbook in the special machine that does the printing of the withdrawals and deposits. It is easy enough to use: you open your book, carefully slide it into a slot, and any new transactions are recorded. The device even has the smarts to turn pages when one becomes full. More than a little annoyed at my oversight, I turned around and marched back to do the test. At first, nothing happened. While the machine’s screen continued to flash annoying SCB advertisements, my booklet lay passively inside it like a Soi 4 streetwalker servicing her fourth customer of the night. Finally, almost as an afterthought, the machine informed me it could not read the book’s magnetic strip, and contemptuously spit it back out. Of course I tried it again…then a third time. Along the way I employed my standard attempt at persuasion when confronted with a balky device, pounding it once with my fist. Loosing one’s cool is considered very bad form in Thailand, but it cleared my thinking. Now the real fun began. I went back into the bank and got in line. When I reached a teller, I pointed to the magnetic strip on my book and waved my hand over it, trying to convey that it wasn’t working. The girl took the passbook, huddled with the one who had originally helped me, and together they fiddled around for a few minutes. Then they handed it back saying there was no trouble, that I didn’t get a response from the machine because there weren’t any transactions to print. This simplistic — and incorrect — explanation shifted the burden of proof back onto me, someone whose level of Thai resembles that of a rather slow three-year-old. My only recourse was action. 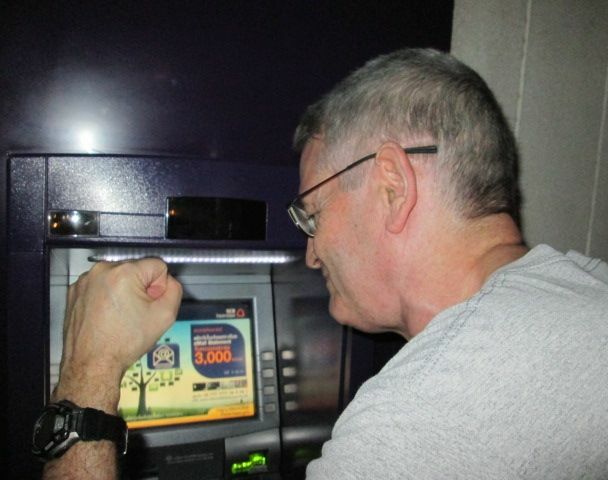 Stepping out to an ATM, I withdrew a pair of thousand baht notes using my debit card. Re-confirming that the magnetic strip was still bad, I returned to the teller holding the two bills in one hand and my purple passbook in another, shaking my head. The point I was trying to make was that there was now a transaction pending, and I could not get it to print. Yet despite the visual aids, I still was not getting anywhere. The tellers seemed to be tolerating me more than anything. With my audience slipping away, I suddenly had an inspiration. The security guard posted out front had been witnessing my struggles against the wicked print machine. After I’d punched it, he’d come over and had seen the error message regarding the magnetic stip. This meant I had a Thai witness to back up my story! Getting his attention, I gestured for him to come in and explain to the girls what the problem really was. This finally got the point across and a seemingly magical operation was done on my passbook which — lo and behold — then worked smoothly when I went out and did yet another test. Re-entering the bank one final time, I thanked everyone: the tellers (cordially) and the guard (sincerely). However, it was my tenacity and resourcefulness that had actually made the difference. Some days you need that in a foreign country. This entry was posted in 2014, 2014: Mar---Apr and tagged Bangkok, Corporations. Bookmark the permalink.